Tagged under Hikaru Nakamura, Shaft (Studio), Series. 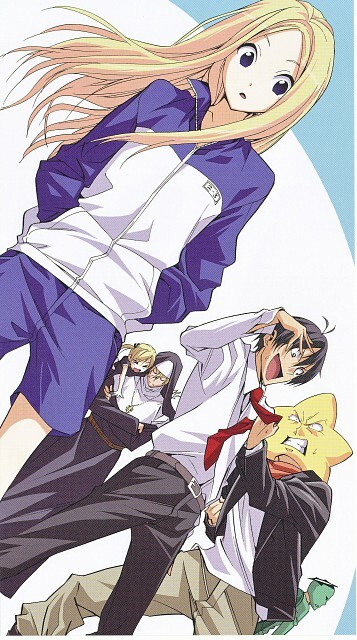 Arakawa Under the Bridge is one of the quirkiest series I've ever come across. Simple, subtle, and hilarious are the only words I can think of to define this series. If you're looking for a good laugh, I would definitely recommend picking this series for your next watch. The characters and plot situations are to die for! Very funny and weird. =D I swear I love this anime! It will crack you up, Im not joking. Just watch it when ever you feel down and trust it will lift your mood right up. But LOL be careful to pay attention to detail since it is a little bit confusing. Surprisingly enough, this series entertained me and caught my interest -- from the colorful personality of each character, to the randomness of every episode. It's worth watching especially for those looking for humor. Arakawa Under the Bridge is about Ichinomiya, Kou who was raised by his father to not have any debts to anyone. And unfortunately, one day, he was saved by a girl who lives by the Arakawa Bridge, Nino. Since then, he felt in debt to her and was forced to live by the Arakawa bridge with her as well. Totally random, which is my type of humour, and the oddity of the characters fascinate me :D The first episode was interesting, although I couldn't help but have the tendency to feel sorry for the main character. I'm hoping that I can have the time to watch a few more episodes! Love it to pieces. I know opinions on this one range quite far and that a lot of people don't like the eccentricity of it, but to me it's the perfect blend of funny, sweet, and charming while upholding serious overtones. Some people have trouble getting through five minutes of it, but for me, each and every second is enrapturing; I am never spared a moment to be bored. I can't even tell you how many times I've re-watched the first episode, but I can tell you that I enjoyed each replay as much as the first time through. It's one of those rare series that never gets old for me. Absolutely hilarious show. Though not quite as awesome as Bakemonogatari, it is still fantastic. And the fact that nearly the entire Bakemonogatari voice-cast is on this show is an amazing bonus to an already great show. "Hi~mo himo himo~! Hi~mo himo himo~!" No feedback on Arakawa Under the Bridge.